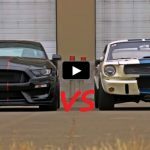 Jim Ring Talks on The SplitR Mustang! If you are a Ford Mustang fan than you know the names behind some of the best custom built classic Mustangs out there. With full attention to details and incredible custom touches Mike & Jim a.k.a The Ring Brothers amaze the pony enthusiasts each year and the 1965 Mustang SplitR is no exception. The body sprayed with Ford Race Red custom paint from BASF, has a lot of carbon pieces on it, it is set on a Detroit Speed chassis and suspension and spins a one-off HRE wheels. The fully customized interior of the SplitR Mustang Fastback is totally off the hook as well and features Recaro seats, gauges by Classic Instruments and wicked steering wheel and pedals. 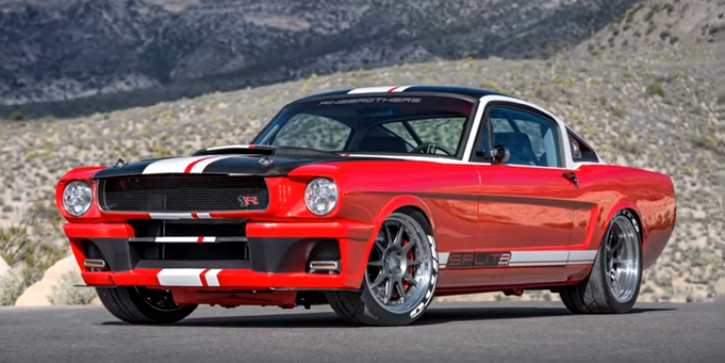 When it comes to power the 1965 Mustang SplitR packs a Ford Racing 427 stroked engine built by Wegner Motorsports with Atomic carburetor linked to a T56 Tremec 6-speed transmission and Ford 9″ rear end. 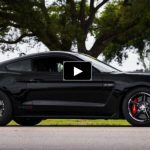 Check out Mustang Connection’s interview with Jim Ring to hear all about this build. Watch, Enjoy & Share!